Protect you main investment from theft, fire or accidents. Whether you are home or abroad, know that your house is being monitored for undesirable threats. With an early-warning system, the proper authorities can arrive at your home and act accordingly. 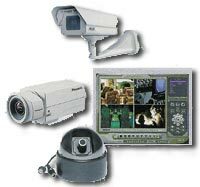 Use cameras to watch the gate, pool, or any other area -- covertly, blatantly or over the internet. A professionally installed system may save you and your family's lives!